As an inaugural member of Clube dos 13, it’s no surprise that São Paulo Futebol Clube is considered one of the marquee clubs in Brazilian football. Their trophy room speaks for itself: 6 Brasileirão titles, 3 Copa Libertadores trophies, and 21 state titles. Unsurprisingly, they’re also one of the most popular clubs in the country, with more than 16 million fans and an annual revenue of over $100 million. 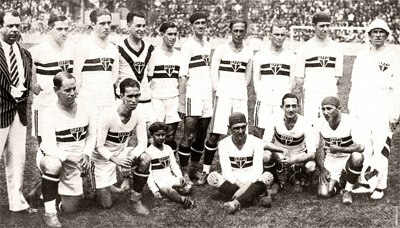 São Paulo Futebol Clube squad in 1930. São Paulo’s official history begins in 1930, when the club was founded by 60 players, former officials, friends, and members of two older clubs from the area: CA Paulistano and AA das Palmeiras. Due to various internal disagreements and financial issues, the club was disbanded in 1935. The same year, it was reformed under the name São Paulo Futebol Clube. The 40’s were the first truly successful era for São Paulo, which started acquiring star players from competing clubs. The new players settled in fairly quickly, leading the club to five Paulista championship titles by the end of the decade. During this time, the club earned the nickname “The Steamroller.” However, the rise of Pelé’s Santos in the 50’s soon relegated São Paulo back to the sidelines. 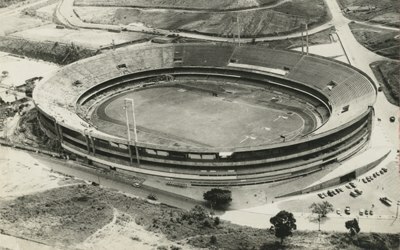 In 1960, the construction of Estádio do Morumbi, officially named Estádio Cícero Pompeu de Toledo, was finished. This was a huge stadium planned for 120,000 people. The construction of the stadium continued during the decade and it got even more seats - in the end of the decade it was big enough to held an attendance of 140,000! After later reconstructions, the attendance potential has decreased radically. The mighty Estádio do Morumbi in 1970. Despite winning two Brasileirão titles in 1977 and 1986, São Paulo struggled to assert its dominance for most of the 20th century. However, this changed with the arrival of Telê Santana, a respected manager most known for putting together the legendary 1982 and 1986 Brazil national squads. Telê ended up staying at the club for five seasons, and this is widely considered to be one of the most successful periods in the history of São Paulo. 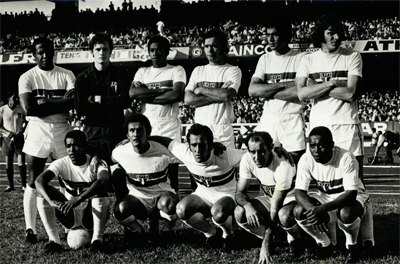 The team lined up in 1971. Led by Telê and the influential midfielder Raí, the club claimed its third Brasileirão title in 1991. The next season, they went one step further and won their first Copa Libertadores title by defeating Newell’s Old Boys in a penalty shoot-out. In 1993, they managed to retain their title by defeating Universidad Católica 5-1 in the first leg of the final; the second leg was merely a formality. Unfortunately, Telê was soon forced to leave the club due to health issues. From 1995 to 2004, São Paulo changed no less than 14 managers. Despite these setbacks, the club remained competitive at the highest level, mainly due to the star power of players such as Kaká, Luis Fabiano, and Rogério Ceni. In 2005, the club finally won its third Copa Libertadores by outlasting Atlético Paranaense in the final. With this victory, São Paulo became the first Brazilian club to claim three Copa Libertadores titles. In 2006, the controversial Muricy Ramalho took over as coach, immediately implementing his trademark defensive style. Though some of the club’s fans didn’t like this change, they couldn’t argue with the results. From 2006 to 2009, São Paulo won three consecutive Brasileirão titles, with Ramalho becoming the first coach to achieve this feat with the same team. The upper part of the logo is rectangular (with the team initials “SPFC” in white over a black background) whereas the lower part is triangular. It includes the tricolor: white, red and black.